Humankind has always been fascinated by the possibilities of creating stone materials that are as solid and shiny as the models they copy – stones formed by nature itself through eons of time. 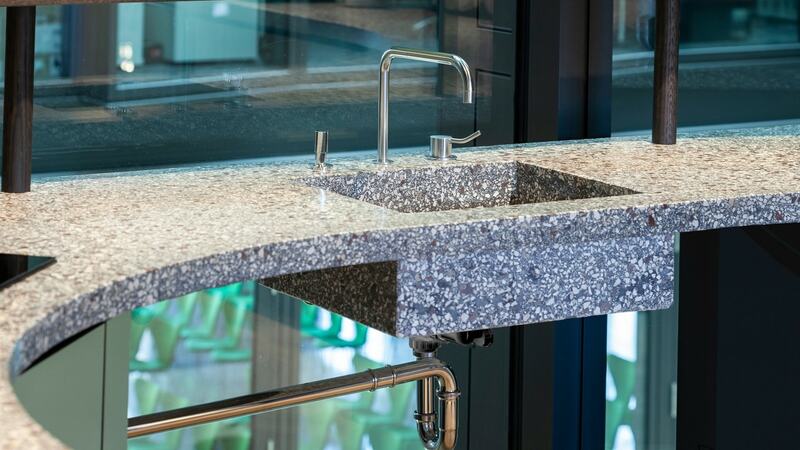 Our natural-stone materials are a good example of how close man-made stone can come to the ‚original‘. The minerally bound materials manufactured by material raum form are dyed with various pigments. On this website, you can have a look at photos of various samples. The colours of these samples may slightly differ from the actual colours of our materials. This depends on the way the colours are displayed on your computer screen. But they also vary in reality, because the pigments we use are natural earth and sand substances that show variations in their composition. Usually, however, the actual colour comes very close to that depicted on the photos. On request, we will be happy to send you samples to look at and touch. It is easy to get your hands on our products: just order samples. It is important that you look at them and touch them. That way, you can form your own opinion about our products. On request, we will send you small sample slabs of any of the materials we use, and in any quality desired. material raum form offers surface patterns in a variety of colours. You can order samples of these patterns starting from € 12,50 per piece. This amount will be credited to your first order. Make a note of the name of the tool – it will be visible by clicking on the respective material. Write to us via the contact form at the bottom of the page or directly with your e-mail, enter the listed material names here.